I promise this is the last word on ASCD10 and I’ll get back to bagging the National Curriculum next week 🙂 So, these are some of my ‘take-away’ points after being back for a couple of days, and before it all fades into distant memory. The American education system IS different. Like us, with state interests, petty politicking, in-fighting and political interferance in things they know nothing about, but unlike us with huge issues in not achieving standards and a real belief that those standards mean something. The emphasis on standards has meant a pretty simplistic interpretation of what successful learning looks like. The day I got back I read that conservative elements in Texas had won the textbook battle and that they were putting their own stamp on History and Economics. ASCD is HUGE; 8000 delegates which means if you’re into UbD, there’s ten sessions on that, if you’re into Curriculum mapping there’s seven sessions on that… Problem is, you have all these interesting conversations in the sessions and never see those people again. Hi to Doug from Oregon, Cyndi from Kansas and Dana from New Jersey. Hope the rest of the conference went well! Like lots of big institutions from the BBC to the New York Times, ASCD is trying to come to grips with what communication means nowadays. A few people spoke about the major shift between ASC09 and ASCD10 in terms of the ASCD embracing much more social networking. ASCD Edge, their new Ning-like network was supplemented by some pretty active and commited twittering from their team. I went to my first Tweeup and met up some of the ASCD crew and some other interesting people. I guess everyone’s looking for the ‘quick’fix’ that can be pushed out to save struggling schools and ASCD has obviously got a key role in supporting teachers and schools but it was interesting to the line-up of experts and the line-up of easy-to-pd lists, templates and frameworks. From UbD to GANAG, from 12 Essential this, to 8 critical that, the tendency to list, reduce and package the solutions was a bit too clear. And a (natural?) emphasis on struggling schools, on getting everyone to a standard, not above it. Most sessions were pretty passive, though to be fair they did have an ‘interactivity’ index in the conference book. The mixed attitudes to teachers, from even within the profession, was evident. Some teachers are ‘achieving’ some are not. 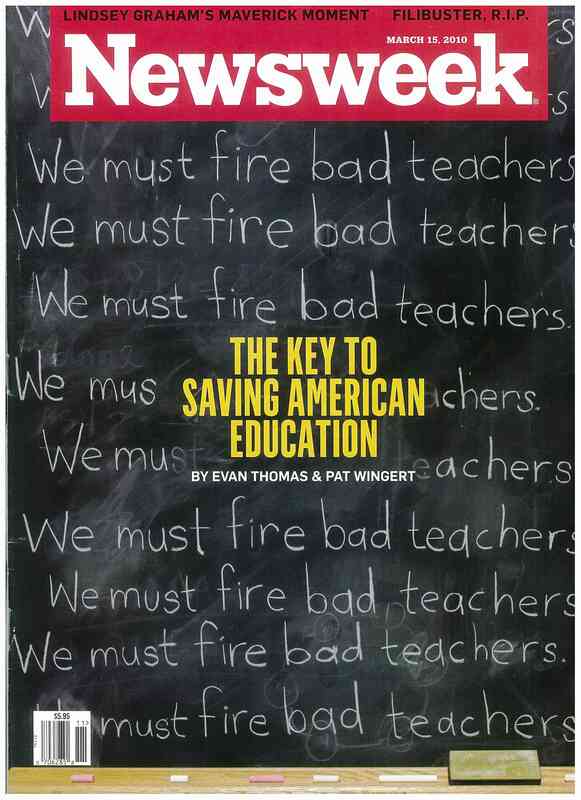 The Newsweek cover (below) I picked up at the airport epitomises where the profession is for some sections of the media, and some of the teachers themselves. That said, the mood was positive, energetic and uplifting. People came to the conference with high expectations and a belief that what they did was important. And it is! This was my final ASCD session 😦 , and it was from the standpoint of teacher education; a university team from Rowan University in Glassboro, NJ, involved in pre-service education, and how they were working with UbD with these new teachers. New Jersey revised Core Curriculum Content Standards in 2008 and that revision was framed in the language of backward design: big ideas, essential questions, enduring understandings. (Wiggins is from New Jersey!) For a brief moment listening to yet another state talk about their journey, I felt that a national curriculum might be a good idea. They began with a single faculty (Science), followed up by a team who went to Princeton to work with Wiggins. Not everyone was on board or enthusiastic (surprise?) However, UbD was infused into all subject matter methods at both undergraduate and graduate levels for initial certification candidates. They then took these ideas and presented it at the Hawaii International Conference on Education in January 2010. ‘It’s everywhere now’ is the message. We then moved into activities (eek): a carousel brainstorming activity which aimed to explore the differences between knowledge and understanding. They also linked UbD (kinda sketchily) with Bloom’s taxonomy and the six facets of understanding (explanation, interpretation, application, perspective, empathy, self-knowledge) and see it as connecting well. Interestingly, they emphasised the terminology of instructional blueprint over lesson or unit plans. And then I was walking out of the big convention centre for the last time, with people heading off to all corners of the United States, many with their bags already packed and heading out to the airport directly, the Exhibitor’s Hall already dismantled and the cleaning staff moving in. I’ll reflect on the big picture meaning of the conference on the way home. I’d like to pick up on the themes and ideas that resonated for me across the sessions and how they apply to my own context. I also want to prepare a presentation summing up some of those ideas too. 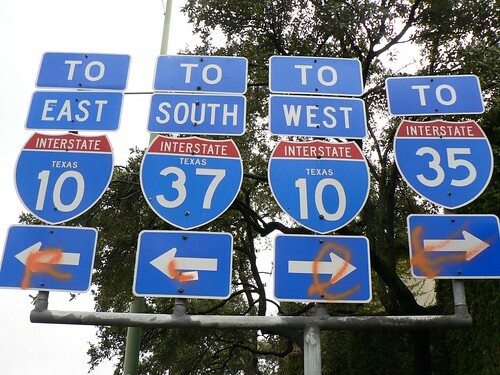 I’ve enjoyed walking around San Antonio too. It’s a strange place from an Australian perspective, Texan, Mexican; a widely distributed city that, according to Wikipedia, is the seventh largest city in the USA at 1.3 million. It certainly didn’t feel that big or busy, or prosperous really, and I imagine a lot of the life of the city must be out in the suburbs away from the city centre. I loved the Alamo and the Cathedral and the Riverwalk, and I’ll post some better photos when I get home and make sense of them. Meanwhile, I’ve got at least 25 hours of travelling ahead of me today, and a long wait at LAX. I was looking forward to the Saturday ASCD session on connecting acronyms because of its powerhouse of presenters: McTighe, Wiggins, Tomlinson and Marzano? (Okay, I didn’t know Marzano), authors of books that have crossed my desk often over the last few years, and important figures in the ASCD world, which seems to be a world of constructing frameworks for better teaching that each have a number of steps or stages, and often catchily titled ones too. Tomlinson: Standards are ingredients to make good curriculum from. Look at the deep intent of the discipline and reconcile the standards with them. Students need ‘teaching up’, to understand the big ideas of the discipline. Wiggins: Standards and textbooks are confused with curriculum; they’re just not the same. Wiggins also announced a new soon to be released template change for the UbD, which generated some murmurs of excitement in the audience. Tomlinson: If our curriculum is murky, then assessment becomes thin. Assessment is too often used by teachers to defend the grades they’ve given. It should influence instruction in an immediate way; use assessment as instruction. Marzan0: Students need to be in the process. McTighe: It’s our goals that determine what assessment should be. Are we only testing things that are easy to test? Be careful of mistaking the measure for the goals. Wiggins: Feedback and its use is often more effective than the initial teaching. It’s not about making time; rigid pacing guides are are not useful in developing learning. Under the present system we keep time fixed and learning varies, what if we reversed that paradigm? He talked up the ‘merit badge’ approach of the Boy Scouts: an authentic accomplishment, not time dependant, feedback given, performance orientated with transparent criteria. Merzano: Good teaching is flexible. A non-negotiable: students learn in your class. Wiggins: Meaning making is falling through the cracks. Different types of goals require different strategies. Tomlinson: The key question that drives all disciplines is ‘What is life? And who am I in it?’ That question lies beyond frameworks. Wiggins: Teachers are far too quick to blame students for failing to learn. 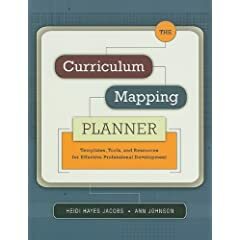 One of the most impressive presenters at the ASCD Conference so far has been Heidi Hayes Jacobs who opened with a session on curriculum mapping on Saturday. I’ve heard her twice now and her message is strong and insistent: no excuses for not changing. In the session on curriculum mapping she managed to breathe life into what is often a pretty dry topic, sometimes by diverging into professional development, and the need for ‘differentiated PD’ for staff, and meetings ‘the wrong people are meeting regularly’ and learning, ‘If you’re going to be a lifelong teacher you’ve got to be a public learner. I thought her most important point on curriculum mapping was that, while it provided gap analysis and help with standards, the most important thing was that it allowed for ‘upgrading’ the curriculum. She talked about curriculum in computer terms a lot, about ‘upgrading’ to the latest ‘version’. I bought a copy of her new book, with the catchy title, Curriculum Mapping Planner, which I’ll be lugging back to Australia. 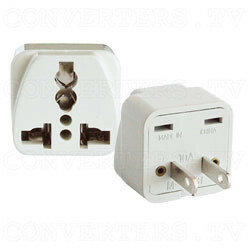 Well, the first thing that nearly derailed me after finally arriving in San Antonio for the ASCD Conference was the fact that I’d bought the wrong international power adapter. So, with a phone that doesn’t roam internationally, and an ipod touch that relies on the computer to charge it up, I had a panicky feeling of disconnection that was compounded by being jet-lagged and dislocated and a long way from home. Actually, it was the second thing. The first thing was standing in a long Friday night line at San Antonio Airport for the airport shuttle bus to the city watching the harassed single young man serving winding up the big roll of credit card receipt paper that had just jammed and unrolled for the third time. I looked at my watch and it ticked over 9.00AM in Melbourne time, exactly 24 hours since I got picked up by a taxi from home and started the trip. This morning, after tramping around San Antonio for a couple of hours yesterday without luck, I found a power adapter in the phone shop next to my hotel. I feel empowered, and am going to start transferring those handwritten notes here as I go.